Lemor Mix is a delicious soft drink cocktail with strawberry and orange flavors accentuated by Sanpellegrino Limonata. If you want a drink that tastes like summer, make yourself a Lemor Mix! Sanpellegrino Limonata marries the delicate sweetness of strawberry and orange to form the Lemor Mix cocktail to create the perfect harmony of tart and sweet. Ideal for those who prefer a softer lemon taste, Lemor Mix is a refreshing cocktail that will keep your thirst at bay all summer long. Try it with some fried salt cod or an onion frittata and let Lemor Mix bring on the Mediterranean sunshine to your snack time. Pour the juice and syrup into the glass. Stir well using a bar spoon and fill up with ice. 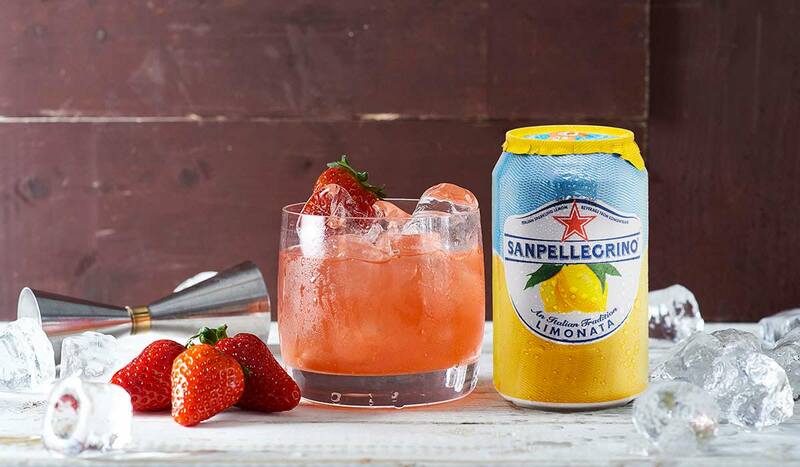 Top up with Sanpellegrino Limonata and garish with a fresh strawberry. If you are 21 years old or over you can turn the Lemor Mix into an alcoholic drink by adding 1 oz of vodka and stirring well.